The most important part about owning and carrying a gun is how to use and carry it safely. Assume all guns are loaded all the time. 1. Apply the safety if there is one. 2. Remove the magazine and set it aside. 3. Lock the slide back and eject the cartridge from the chamber. 4. Visually look into the chamber and check with your finger (touch) to ensure the chamber is empty. 1. With the hammer lowered, open the cylinder gate. 2. Eject any cartridges in the cylinder. 3. Visually check each chamber in the cylinder is empty. Rifles and shotguns will vary; refer to the manual or research online. Whenever picking up, accepting, or handing over a firearm, check to verify that the weapon is loaded. Firearms should only be handed over with the action open and safety on, if available, excluding certain circumstances like self-defense or by experienced shooters while hunting or on the range. If you must hand over a loaded weapon, clearly inform the recipient that the weapon is loaded and advise them if the safety is on or if the weapon lacks a safety. Keep your finger off the trigger until your sights are on target and you are ready to shoot. Never trust your safety. Touching a trigger accidentally may cause the gun to shoot at the wrong time. Many deaths and injuries have been caused by unintentionally pulling the trigger. Unless you are carrying the weapon in a holster, using it for self-defense, or actually hunting, it is best to keep guns unloaded until ready to shoot. Handguns come with many types of safeties. Some have external levers, some only have devices to keep the gun from firing except when the trigger is pulled. Learn about the different types of guns, learn about your gun (read the manual), and know how guns work (Gun Components & Gun Parts). Handguns come with many types of safeties. Some have external levers, some only have devices to keep the gun from firing except when the trigger is pulled. Know how to draw from a concealed holster if you carry concealed. Control where the muzzle is aimed. If on a shooting range keep the gun pointed downrange (towards the target). If you are not on a shooting range, it is best to point the gun down and away from anyone's legs or feet. The safest direction depends on where you are and what you are doing. Never point the gun at anything you are not willing to shoot. Never point a gun (loaded or unloaded) at another person. Don't point a gun at anything that you don't want to destroy, like your car, a wall, or a TV set. 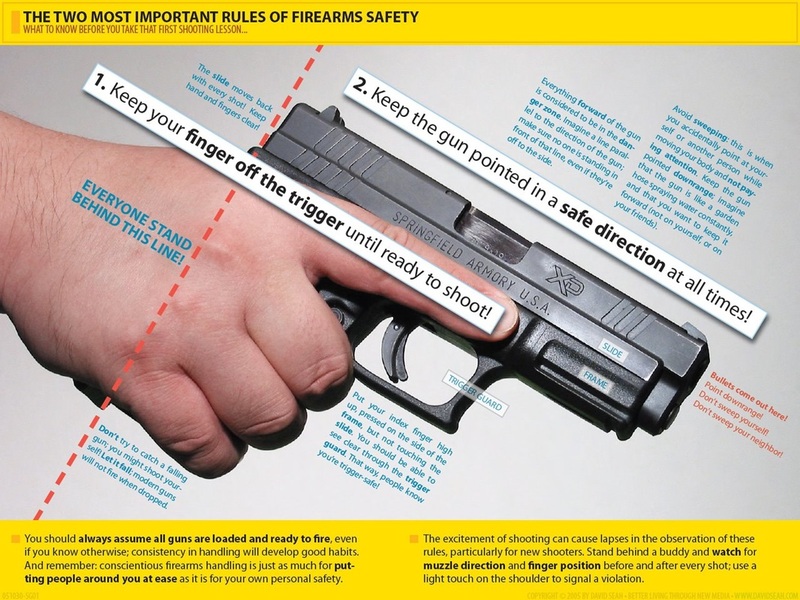 If you do have a negligent discharge, if the gun is pointed in a safe direction. Know your target and what lies beyond. Make sure the area of your target is free of people, property, or animals. Don't shoot at random objects until you have inspected them. On a target range, make sure you have a safe backstop like a hill or berm behind the targets. In self-defense, you wouldn't necessarily want to shoot at a criminal if he is surrounded by children. When hunting, ensure that if you miss, you will not hit a person or something else. Do not shoot on or over a road and shoot away from buildings. Lock your guns away when not in use, especially if children are in the home. Guns should either be in a safe place or on the person. Use a gun safe, gun cabinet, locking container, or gun lock that prevents it from firing. Children should never be able to access a firearm, even if they have been trained in gun safety and they are well-disciplined. Unsecured firearms are the leading cause of accidental firearm deaths to children. The NRA recommends: STOP! Don’t Touch. Run Away. Tell A Grown-up. Know the caliber and what loads are appropriate for your gun. For example, 9x19mm Parabellum (Luger) is different than 9x17mm, which goes by a variety of names like .380 ACP or 9mm Kurz. Some 9mm Parabellum guns cannot safely shoot high-power loads like +P+. Wear ear and eye protection when shooting. Clean and maintain your guns. Make sure the gun is in good working order and that the barrel is clear of obstructions. If you are shooting and a bullet does not come out when you fire the gun, but the empty case ejects, make sure the bullet is not lodged in the barrel. See a gunsmith. Do not attempt to fire another bullet to push the first one out. Your gun may explode.